Venture off the beaten path to explore some of Mother Nature’s most surreal and awe-inspiring features right here in the United States. If you’re looking to make your next trip a bit more unique, you won’t be disappointed when you check out these surreal locations, perfect for exploring on your next adventure. Whether you want to hike around active volcanoes, race across salt flats or just capture some incredible photos, these destinations across the United States will never fail to show just how diverse and inspiring our planet can be. Picture yourself standing on the flattest place on earth, surrounded by glistening white salt for miles and miles. This is what you will find at Bonneville Salt Flats, located in the northwestern corner of Utah. The view from the flats is so unobstructed that you can actually see the curvature of the earth, making for a surreal but also picturesque landscape. The area is famous for land speed records due to its flat and expansive setting perfect for racing, with top speeds clocked at over 300 mph. If you happen to visit during August, you may lucky enough to catch Speed Week or you can check out the World Finals of racing during early October. But you don’t need to be a racer to visit the flats. For a more leisurely pace, you can drive your car on the flats, and access is free to all visitors. While you’re in the area, pay a visit to the nearby Silver Island Mountains, another surreal sight. On top of Floating Island you can even find cave etchings that date back tens of thousands of years. 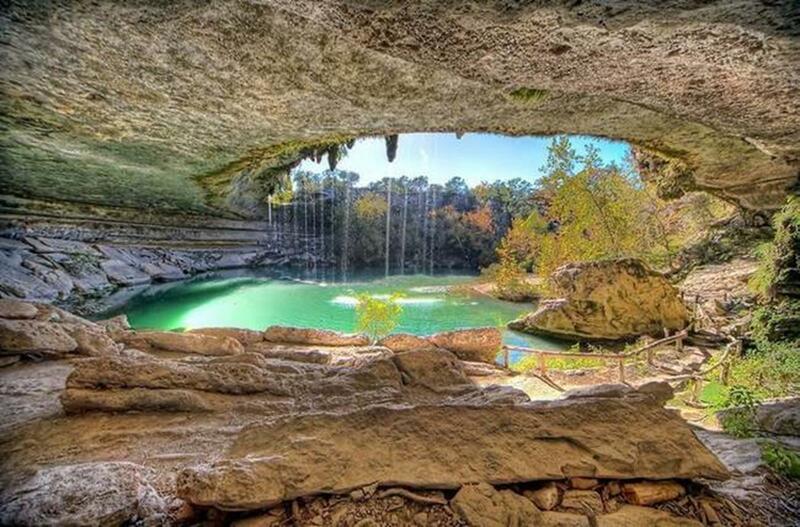 The cave formations of the Hamilton Pool Preserve have formed a hotspot for swimmers looking to cool off in the Texas heat and hikers who want to escape the city and check out one of the state’s natural wonders. As you swim in the gorgeous grotto with its crystal clear waters, you’ll see fish and other creatures and maybe even feel them brush by your legs. This naturally-occurring feature was created by the collapse of a cave into Hamilton Creek, and huge limestone cliffs surround the pool while giant stalactites hanging from the ceiling high above. The price to visit is $15 per vehicle, but it’s well worth it to spend the day relaxing, swimming, and enjoying a picnic on the pool’s beach. You’ll have the chance to walk inside the collapsed grotto and step under a 50-foot waterfall in a scene that’s straight out of a movie. The colorful, waving, surreal images of The Wave are a photographer’s dream. Located in northern Arizona, bordering Utah, this major sandstone trough and those surrounding it date all the way back to the Jurassic age. These sedimentary rocks have been eroded for millions of years, exposing countless layers of rock strata in deep reds and oranges. Small streams allow for some interesting wildlife to live among the mesas, buttes and steep canyons. The hike in can be a challenge as you create your own path, and you’ll need a day-use permit to visit the area; only 20 permits allocated per day. But while access is limited, it also means visitors have a chance to experience the area as it was meant to be: quiet and unspoiled. The shortest path in is just over eight miles and you can be sure that every turn will provide spectacular and breathtaking views unlike anything you’ve seen before. But don’t worry – a guide is provided that can be used with a GPS or compass to help you forage your way across the desert plateaus. If you can get a permit, this location is a must-see. 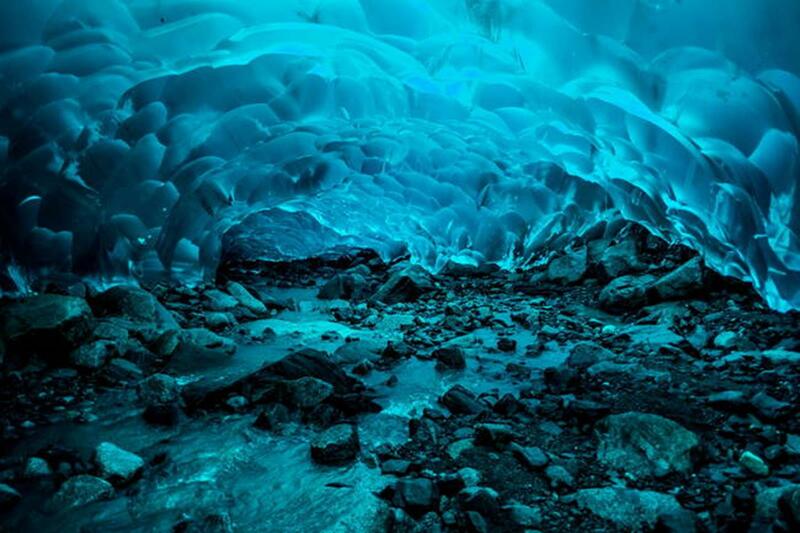 Some may describe the Mendenhall Ice Caves as “otherworldly” or “surreal,” and you can see for yourself just outside of Juneau. The deep blues and changing hues are some of the most spectacular in the country, and perhaps the world. Inside the caves water runs over rocks and under vibrant ceilings inside a glacier that has been partially hollowed out. Stretching for 12 miles, the caves are only accessible for those willing to kayak in and then ice climb over the glacier. But once inside, visitors are treated to a natural wonder that showcases various stages of the water cycle in one place, from melting to freezing. Unfortunately, changes in the earth’s climate are resulting in glacial melting, and the Mendenhall Glacier has receded almost two miles since 1958. So pay a visit sooner rather than later. Driving along State Route 34 in northwestern Nevada’s Black Rock Desert, you may be surprised to catch a glimpse of this odd misshapen geyser off in the distance. This geyser is in fact not a natural phenomenon, and unlike many of our country’s wonders it hasn’t been around for centuries or millennia. 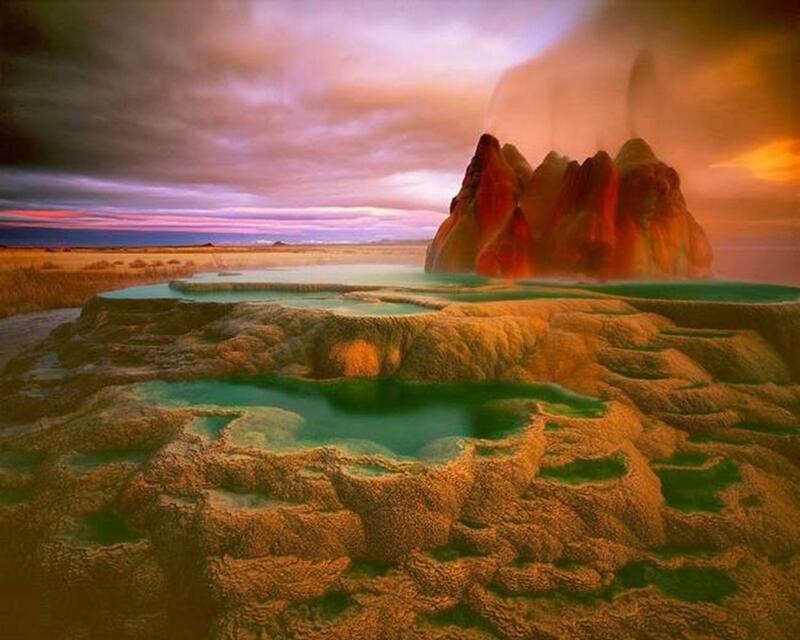 In 1964 on an exploration for geothermal energy, Fly Geyser as it’s known today was created by well drilling. Likely due to an uncapped or unplugged well, dissolved minerals rose up and accumulated near the surface. This created a travertine mound that continues to grow, with water constantly released high into the air. Fly Geyser emits water over into pools covering an area of 74 acres, so it’s hard to miss it, along with the vibrant colors that are due to the algae on the geyser’s surface. 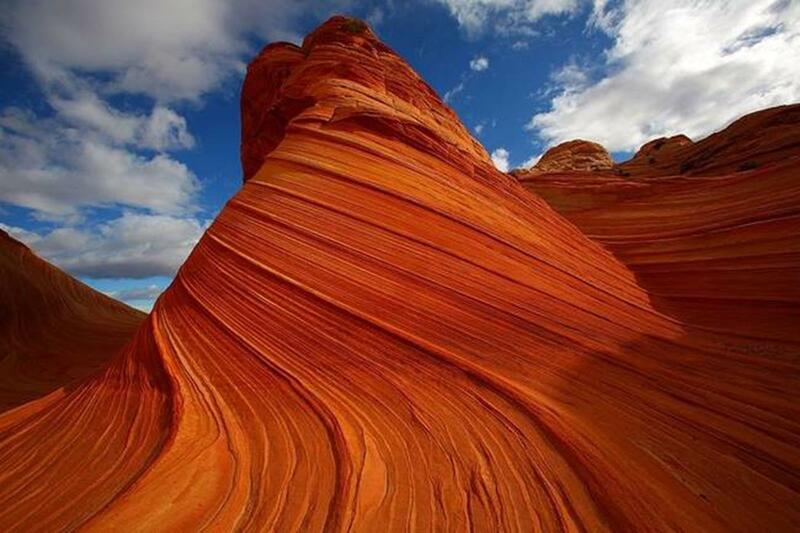 Although this surreal formation is on private land, it’s easy enough to stop and watch from the nearest road. There are few places on earth where you can get as up close and personal with active volcanoes as in this spectacular national park on Hawaii’s Big Island. Spread out over a massive 500 square miles, this is the perfect place for some truly unique hiking opportunities in an otherworldly environment. 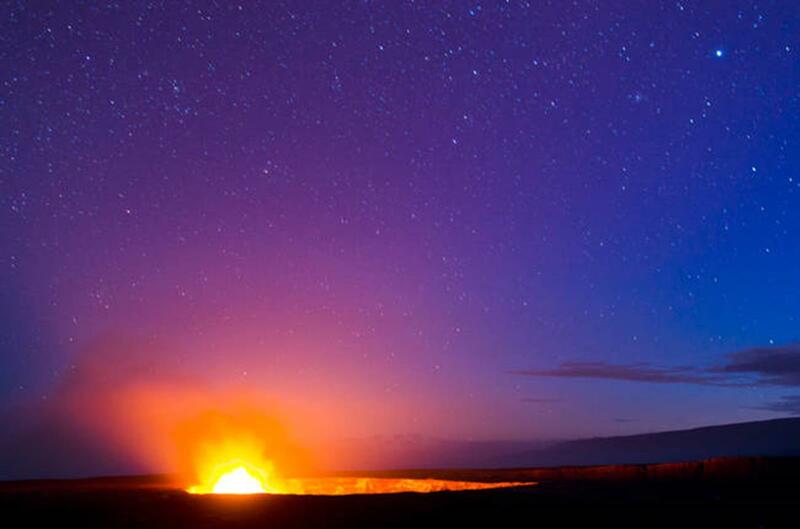 Within the park you can see everything from lush tropical rainforests to arid and barren desert and the most massive of Earth’s active volcanoes, Mauna Loa. Check out the extreme forces of nature by cruising along Crater Rim Drive to explore the summit of Kilauea volcano. This 11-mile journey will guide you through both desert and rain forest, down to the caldera floors, and offers plenty of stops to walk around and take in the awe-inspiring show before you. Before you visit, a quick online search will alert you to any closures due to volcanic activity. Horsetail Fall is enough to make anyone feel small as they gaze up at its drop of over 2,000 feet. Located in Yosemite National Park, this giant waterfall flows seasonally in the winter and early spring on the east side of the world-renowned El Capitan. An incredible and jaw-dropping sight can sometimes be caught in February if the conditions are just right. You’ll be able to see the waterfall illuminated a stunning orange and red color, a phenomenon known as “Firefall.” The waterfall is in fact two streams that gather three-quarters of the way down the rock face before descending to the valley floor. For photographers and anyone wanting the best view of this stunning waterfall, head to the picnic area on the north road leading out of Yosemite Valley. Once at the waterfall you’ll see just how much there is to explore in the valley, which serves as a perfect destination for outdoor-lovers to see some of Mother Nature’s greatest natural creations. Have you visited any of these surreal destinations or are there any you think shouldn’t be missed? Share with us in the comments below!